Think the Tidal Basin is the only place you can experience the Cherry Blossom Festival this spring? Try grabbing a bar stool instead. 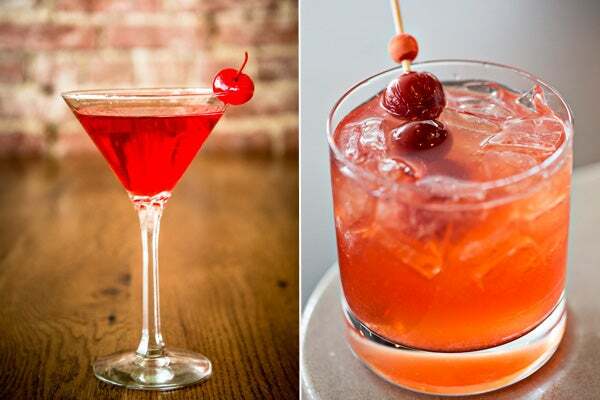 As part of the fest's Cherry Picks program, bartenders and mixologists all over town are offering cherry-tinged cocktails that will make your happy hour that much sweeter — or a little bit tart, if sour is more your speed. Here are a few of our favorite must-try concoctions that use everything from smoked cherries to cherry blossom tea syrup. Consider this the perfect cheers to blossom season and spring in Washington — minus the epic crowds headed our way. The gin rickey, a.k.a. the official cocktail of D.C., is getting a spring makeover at Passion Food Hospitality’s downtown restaurants. Acadiana, Ceiba, DC Coast, and District Commons are all serving a cherry gin rickey ($12), featuring a mix of Small’s Gin, Leopold’s Tart Cherry Liqueur, lime juice, soda, and Fee Brothers’ Cherry Bitters, served with a cherry garnish. Acadiana, 901 New York Avenue NW, 202-408-8848; Ceiba, 701 14th Street NW, 202-393-3983; DC Coast, 1401 K Street NW, 202-216-5988; District Commons, 2200 Pennsylvania Avenue NW, 202-587-8277. 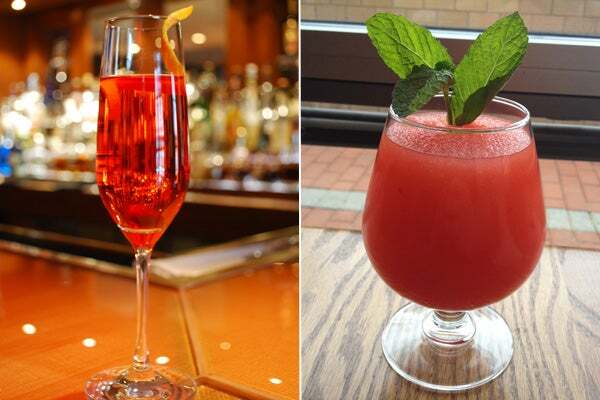 Try a taste of la vita bella at cozy date spot Room 11 in Columbia Heights, where you’ll find the Italian-accented Angelina cocktail ($11). The complex drink combines cherry shrub — a reduction of fruit, vinegar, and sugar — with cognac, fresh lemon, Peychaud’s Bitters, and Finocchietto fennel liqueur from local company Don Ciccio & Figli. Room 11, 3234 11th St NW; 202-332-3234. Head to Mari Vanna to experience the Russian hot spot's signature cherry cocktail ($9), a potent, bright red concoction that should satisfy even the most discerning sweet tooth. Mari Vanna, 1141 Connecticut Avenue NW; 202-783-7777. Adams Morgan’s hip and inviting French bistro Mintwood Place is mixing up a decadent-sounding brandy roasted cherry caipirinha ($12). Mintwood Place, 1813 Columbia Road NW; 202-234-6732. A cocktail with "honey drinking vinegar" as an ingredient sounds a little intense, but we’re on board when it’s from the mixologists at Park Hyatt Washington. The Blossom cocktail ($14) features acclaimed New York restaurant Pok Pok’s Som honey drinking vinegar, Cherry Heering liqueur, cherry blossom syrup, lime zest, a splash of soda, and both Maraschino and dark Amarena cherries. Park Hyatt Washington, 1201 24th Street NW; 202-789-1234. Cherry cola gets sophisticated at Epic Smokehouse in Pentagon City. The grown-up version ($10) cuts the sweetness of Coca-Cola with bourbon-infused black cherries. Epic Smokehouse, 1330 South Fern Street, Arlington; 571-319-4001. Order the Sparkling Sakura ($15) at Quill at The Jefferson hotel for a very zen combination of cherry blossom tea-infused syrup, sake, cherry puree, and prosecco. Quill at The Jefferson, 1200 16th Street NW; 202-448-2300. At Elisir, an intriguing smoked-cherry reduction is mixed with Sambuca and spice dram for the Crush Velvet cocktail ($12). Elisir, 427 11th Street NW; 202-546-0088. Three words: cherry bourbon slushies. Pizzeria Orso’s seasonal concoction is an icy and boozy mix of cherries, bourbon, fresh orange juice, and lemonade ($9). Pizzeria Orso, 400 South Maple Avenue, Falls Church; 703-226-3460.